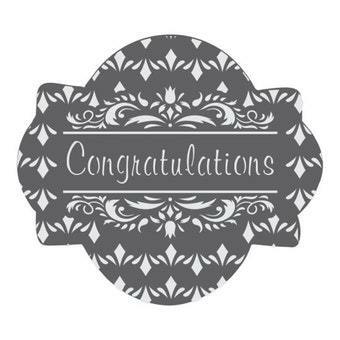 This Congratulations Prettier Plaques set contains four stencils and one masking piece, and has been thoughtfully designed in partnership with Julia Usher, to make message plaques prettier than ever. Thanks to the masking piece, backgrounds no longer have to overlap text areas. Plus, all sets fit the most popular 3- to 4-inch plaque cutters, allowing backgrounds to display beautifully! The instructions in the PDF below explain how Julia typically creates a fully layered look, but feel free to improvise. Each stencil can be used on its own or with others in the set. Messages and frames can be mixed and matched with backgrounds in other sets. And all stencils work well with both royal icing and airbrushing.